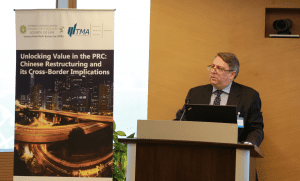 Tanner De Witt was delighted to participate in the 2015 TMA Symposium which took place on Friday 23rd October in Hong Kong. Robin Darton chaired the first session entitled The NPL Portfolio Investment Cycle in the PRC: from Origination to Exit alongside Clement Sun, Director of DAC Financial Management (China) Ltd in Hong Kong. The Symposium was well attended by insolvency practitioners from across the region who engaged in deep discussions about insolvency and restructuring related issues in the PRC. Turnaround Management Association (TMA) brings together professionals from across the UK, Europe and worldwide to meet, network and hear the latest news within business recovery, corporate turnaround and restructuring. Founded in 1988 as a non-profit organisation for professionals in corporate renewal and turnaround management, the TMA’s international headquarters is in Chicago (TMA International), and there are regional Chapters worldwide. It has in total over 9300 members. Ian De Witt and Robin Darton are both members of the Hong Kong chapter of TMA. Ian and Robin co-head the Restructuring and Insolvency practice at Tanner De Witt which is consistently ranked highly by publications such as Chambers & Partners (Band 1 ranking) and Asia Pacific Legal 500 (Tier 1 ranking). Ian and Robin are widely considered to be leaders in this field in the region. For more information about Tanner De Witt, please use our Contact page.